Victoria Squire Art and Design | Expressing and sharing excitement for the brilliant colors in life. 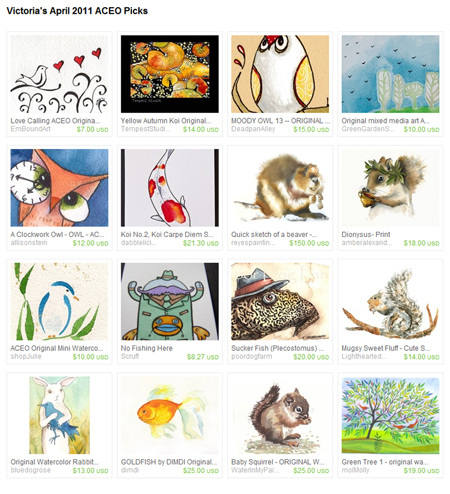 I have created a treasury in Etsy showcasing my Aprils picks or ACEOs. ACEO is short for Art Card Editions and Prints. They are trading card sized artworks. They have to be trading card size so that they can be called ACEO or art card. ACEOs are an economical way to put together an art collection. You can even get ACEO sized frames or albums. Some frames showcase several ACEOs. The small size of the work also helps save precious space in small homes or offices. I think the idea is nifty.